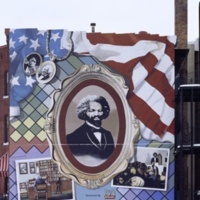 Location contains "Washington D.C. "
In 1989, muralist Alfred Smith painted a mural in Anacostia, D.C., near Frederick Douglass’ residence during the last years of his life. 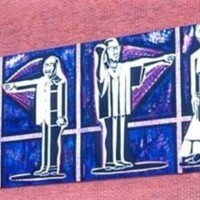 It depicted the silhouette of Douglass alongside scenes from a labour protest. 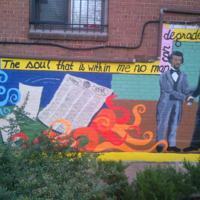 The mural, titled The Dignity of Work, contains a quotation from a speech by Douglass in 1888 before the International Council of Women. 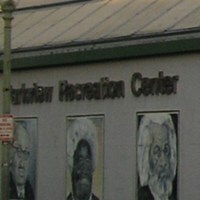 The mural had been destroyed by 2016. In 2011, muralist Aniekan Udofia painted Bread for the City in Anacostia, D.C., close to the historic site of Frederick Douglass' house. The mural depicts Douglass in the younger, radical phase of his life, surrounded by doves and children, and the words “One People,” “One Community,” and “Building Together.” By 2016, the mural had been destroyed. G. Byron Peck created this mural in Washington D.C. on the side of a boutique hotel called the Swiss Inn. 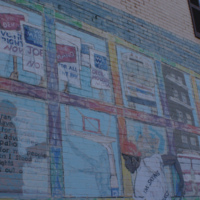 In 2002, the mural was lost from public view when a luxury apartment complex was built next door, against the mural wall. 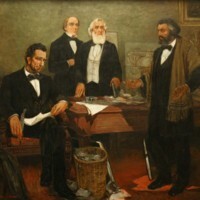 The image depicts multiple stages of Frederick Douglass’ life against the backdrop of the American flag. 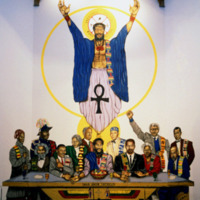 In the 1990s, Peck became well-known in Washington D.C. after covering more than 300,000 square feet of the city's walls with his murals. Peck is now the founder, artistic firector and lead artist for all City Arts murals in the D.C. area. 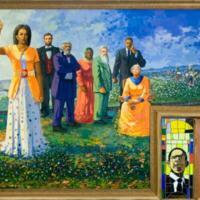 In 1976, Eugene Eda Wade created a mural at Howard University in Washington D.C. 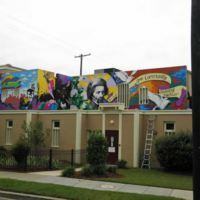 The mural depicts the abolitionists Sojourner Truth and Nathaniel Turner attempting to break chains, as well as the abolitionists Frederick Douglass and Harriet Tubman, and leaders Malcolm X and Martin Luther King Jr. The mural has now been destroyed.